15 Songs Every Kid Should Know and Will Love! Is quite the compilation of traditional children’s songs. The compilation’s title is long, given. But the songs are short. That’s just one aspect of this compilation that both parents and children will appreciate. Just as worthy of praise is that while many of these songs are pieces that ones that transcend generations, they have been re-imagined for a whole new generation. They have all the same lyrics. But the vast musical styles that span the compilation make for even more appreciation and enjoyment. This is actually a dual aspect that makes this compilation even more enjoyable. Adding to the overall presentation of the compilation is its gatefold packaging. The disc is contained inside a sleeve that is just tight enough within the packaging to keep it from sliding out but not too tight to cause any potential damage in trying to get it out. The liner notes written by compilation producer Jeffrey Friedberg help parents and teachers to understand how and why he decided to assemble this set of songs. All put together, the liner notes, the packaging and songs make this compilation one that any parent and teacher will enjoy and appreciate just as much as its intended younger audiences. Right from the start of 15 Songs… listeners are treated to a fun, funky re-imagining of the song, ‘5 Green & Speckled Frogs.’ The song is sung by singer guitarist Adam Falcon and the members of the Bossy Frog Band. The song itself is so catchy that even adults might find themselves tapping their toes and…ahem…feeling froggy (pun fully intended here) in listening to this piece. It makes for a great opener to the compilation. The song itself is enjoyable, as has already been stated. What’s most interesting about this track is that if a person were to listen to this track not knowing it was Adam falcon on vocal duties, one would think it was Ben Harper singing. This is how close the two are in their vocal style and sound. ‘5 Green & Speckled Frogs’ is a wonderful first impression for listeners of all ages. The compilation’s enjoyment doesn’t end after this song, either. Listeners get a dose of Zydeco in the re-imagining of ‘Shoo Fly.’ Just as with the compilation’s opener, even adults will enjoy this catchy tune. The same can be said of so much of this compilation, including the Dixieland/gospel hybrid styled reboot of ‘Itsy Bitsy Spider’, the rockabilly style sound of ‘If You’re Happy and You Know It’, and the Celtic vibes of ‘Waltzing Matilda.’ There’s even an interesting take on ‘The Wheels on The Bus.’ Unlike so many takes on the song, this one is set to the beat of African drums. Of course, this is just a glance of the fun that listeners will get throughout this record. It offers so much more musical variety for listeners of every taste including some rather surprising takes on other songs. For instance, there is the aforementioned take on ‘The Wheels on The Bus.’ Just as interesting is the Afro-Cuban base for ‘Old McDonald.’ Who would ever have thought that a song about a farmer and his animals would gel with a musical style that generates thoughts that are the polar opposite of a farm? But somehow, it works as does each song included in this compilation. The musical variety presented in this record is good fun on the surface. On a deeper level though, it serves a whole other purpose. That secondary purpose is that it exposes young listeners to the variety of musical styles from around both America and the world. This serves as a starting point for teachers and parents alike to talk about not just the musical styles but how people from different parts of America and the world differ in their cultures. So on that level, it makes this collection of songs that much more important for young listeners. If a child can be taught at the most basic of levels, the differences in cultures and why those differences are important, then this is can make all the difference in a child as he or she grows older. Keeping this in mind, it shows the increased importance of each song’s different musical style. And in turn, it shows the importance of this compilation for any parent and teacher of young children. The compilation will be released Tuesday, August 6th via Bossy Frog Productions. 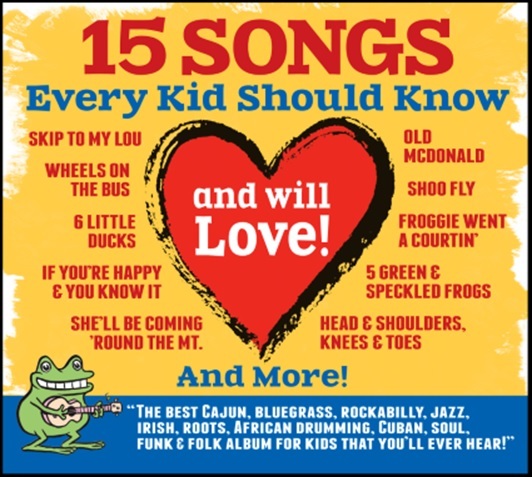 More information on the compilation is available online at http://www.facebook.com/15SongsEveryKidShouldKnow and http://www.15SongsEveryKidShouldKnow.com. This entry was posted in Internet, Music and tagged 15 Songs Every Kid Should Know And Will Love, 5 Green & Speckled Frogs, Bossy Frog Productions, Courageous Living, entertainment, Eyevolution Optique, facebook, If You're Happy and You Know It, internet, Jeffery Friedberg, music, Old McDonald, Phils Picks, Shoo Fly, The Itsy Bitsy Spider, The Montessori Center of Nyack, Tumble Bee Gymnastics, Wheels on the Bus, Wordpress by philspicks. Bookmark the permalink.